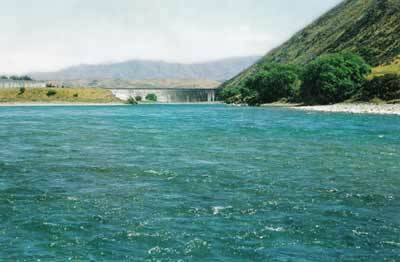 View of the Waitaki Dam from the mouth of the Awakino River. By late summer most small rivers and streams are well past their best, through low water and being overfished. 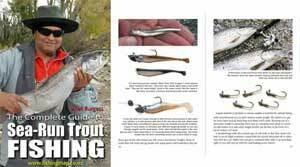 Most anglers choose fly fishing on medium or small sized streams where they can spot and stalk their fish, moving into position behind the fish to make the cast. This is quite challenging on big water. Once you learn the fundamentals of fishing these larger waters, like me, you will find those big rivers have some of the best fly fishing. It takes time to learn about fishing big waters, so when the Waitaki Lakes went into decline I had to find greener pastures and at this time of the year the best water was in the bigger rivers such as the Rakaia and Waitaki. Ask the salmon anglers up-river most of them would have caught trout from time to time. One summer I was salmon fishing up the Rakaia River below the gorge. Crossing side streams on my way to find a good hole, I spooked a trout of about 8 lb, unfortunately, the fly rod was back in the car and it was too far for a return trip. A little further on I came across four trout rising in the tail of a salmon hole, so now I have a four-piece fly rod with me all the time. I began to study the big rivers, learning to read the water, as fish in smaller streams use deep water to provide cover. 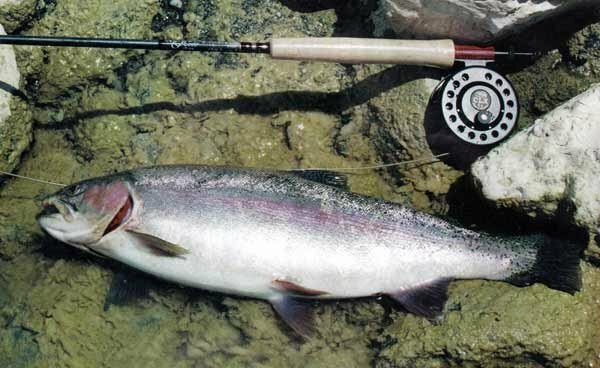 There are large areas of deep water in big rivers, but not all of it is suitable to hold fish, so we must look for water with the right conditions for holding fish. Bottom types in big rivers like the Waitaki normally have stable beds so the insects have a good chance of survival. This also makes for slippery conditions. Current speed will show whether or not it’s too fast for holding, along with surface type, whether it’s flat or ripple. Different times of the day will dictate where the fish will be. Early in the morning, I have found them close into shore, in about waist deep water of moderate current, shingle bars, and with obstructions such as willows which slow the current and are ideal spots for trout. This pretty 4 lb rainbow trout was taken on a Caddis imitation. You need to fish a big river more slowly. I usually start at the tail of the pool I have chosen and work along the edge from the bank to where the colour goes deep blue. The water is slower at the tail and shallower. Fish tend to hold where one or two streams meet. Food types can have a bearing on where fish will hold to feed. Insects like caddis in a big hatch will move fish all over. The Christmas I fished the Waitaki I decided to check the conditions of the lake. A strong nor’wester was blowing down the lake making conditions hopeless with a 6wt fly rod so I dropped down below the dam. I started fishing a bluebottle dry and had a rise almost straight away but he came short. Moving on upstream trying to punch a line out was hard work, so I sat down to put on a No 7 line. As I was doing so, a caddis landed on my hand and another on the stone next to me. With a quick look at the river I noticed many, more were dancing their way downstream so on went a deer hair caddis, but no luck. By now it was about one pm and moving upstream I tied on a small feather wing caddis and carefully waded out over slippery boulders to where I could cover the deeper water. The caddis had caused the fish to move to midstream and on my second cast I was into a nice fish. He raised level to me, a good brown of 3 1/2 lb. I thought about our barbeque tea but put him back for another day. I dried the fly and away with another cast. Something took my eye off the caddis and it began to swing on the current. Wham, a solid fish hit the fly, a couple of good runs and I had a nice 4lb rainbow. This one did join us for tea. I caught two more browns that went back, so a limit bag was caught on a big river when everyone else was spinning. Big waters also have backwaters. Insects collect in these areas as they are usually surrounded by lots of willows. Big searching flies are good patterns; size 10 Royal Wulff and Bluebottles fished upstream, even when no hatch or rise is visible. Blue Bottle nymph. I have taken fish on rainy days with these flies. There’s not a lot of wading needed on these big rivers. If you can’t fish a spot it’s not worth a swim over at the head of a pool. Once you have fished your way up, try a sink tip line and a Gold Rib Hare’s Ear nymph. Cast up and let it swing and keep in touch for a take. Night dry fly fishing on these big waters can be fun, as the fish move from the deep into feeding positions, and again the caddis is your weapon using a well oiled high-floating pattern on a slightly heavier cast, as bust-offs do occur. One last thought. Check the stomach contents of your fish, should you take one. The rainbow I caught had brown beetle caddis larvae and a few other caddises. Remember this for the future, and keep a fishing record, not for numbers, but to help you make well-rounded decisions next time. Genuine fly fishing for salmon.